Mt. 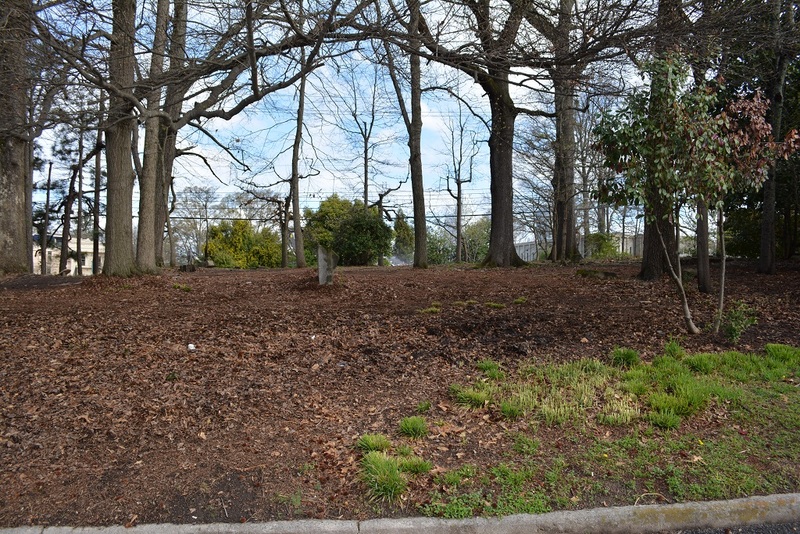 Olive Cemetery, located on a 0.22-acre wooded parcel adjacent to Frankie Allen Park, is one of the last remnants of Buckhead’s African American heritage. The cemetery was established next to the Mt. Olive African Methodist Episcopal Church. The church, which was located adjacent to Pharr Road, was formed by newly freed slaves and existed as early as 1870. In 1921, developer John Owens laid out a formal subdivision called Macedonia Park for the African American residents who had gravitated to the area. Generally, the residents worked on nearby farms or performed domestic service for Buckhead’s affluent white citizens. A few, like William Bagley, were entrepreneurs who established businesses in the neighborhood. Macedonia Park eventually became a thriving community with over 400 residents, three churches, two grocery stores, barber shops, and restaurants. However, between 1945 and 1953, Fulton County acquired all of the homes in Macedonia Park through coercive negotiation or eminent domain to make way for a public park, which was originally called Bagley Park, but is now named Frankie Allen Park. Residents received anywhere between $0 and $5,000 for their property. Read the Conger Report to learn more about the proceedings of the Fulton County Parks & Recreation Department in the 1940s and 1950s and the importance of Mt. Olive Cemetery and Frankie Allen Park as cultural landscapes. Mt. Olive Cemetery, which contains the graves of residents of Macedonia Park and worshippers at Mt. Olive AME Church, is the only remaining physical evidence of the community of Macedonia Park. In 2005, TRC Garrow Associates, Inc. delineated the boundaries of the cemetery. They also conducted an archaeological investigation using probing and GPR (ground-penetrating radar) and identified 45 features that likely represent graves. Just a small portion of these are marked with headstones, and only two are legible: Savannah Barnes Holmes and Essie Davis. Savannah Barnes was a graduate of Morris Brown University and subsequently became a teacher in 1916. By 1919, she was a teacher at the Holmes Institute for homeless children on Fort Street in downtown Atlanta. In 1920, Savannah married Rev. B. R. Holmes, the president of the Institute. After her death in 1927, her obituary stated that she was “for many years an active member of Big Bethel church, a member of the alumni association of Morris Brown University. She was among the most cultured of our race.” See her headstone before and after recent repairs here. Meanwhile, Essie Davis worked as a maid in the Buckhead community and was a young woman in her 20s when she died in 1928. Historian Bill Bell has described the symbolism on her headstone: “The parents’ grief is reflected by the lamb at the top of the marker, which is a symbol of innocence or a child. 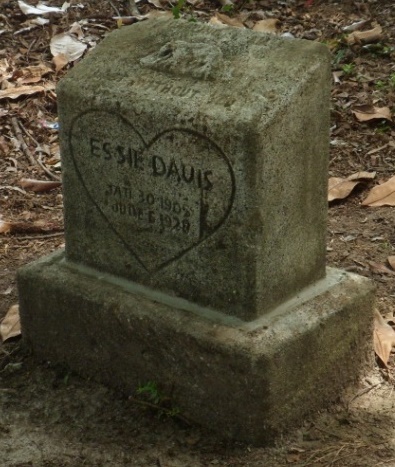 The heart around her name on the front of the marker means she has gone from being surrounded by her parents’ love to rest in God’s love.” Obituary and death certificate research indicates that Essie Davis was a widow at her young age; her husband, Matthew Davis, was buried at the same cemetery in 1925. Many of the last documented burials were in 1945. Find A Grave documents 8 interments, some of which are based on obituary records. Buckhead Heritage has steadfastly advocated for the preservation of Mt. Olive Cemetery and successfully prevented a developer from removing graves from the site in 2010. The organization has also led two efforts for the rehabilitation and repair of headstones in the cemetery. To learn more about Buckhead Heritage’s efforts to preserve Mt. Olive Cemetery, click here. Bell, Bill. “Mount Olive African Methodist Episcopal Church and Cemetery.” Unpublished history written for Peachtree Heights East Neighborhood Association. “High Tribute Paid Faithful Ex-Slave,” (Lulu Williams), Atlanta Constitution, January 6, 1918. TRC Garrow Associates, Inc. “Archaeological Delineation and Preservation of the Mount Olive Cemetery, Buckhead, Fulton County, Georgia.” May 2005.